Poblano-Cheddar Twice-Baked Sweet Potatoes | What about this? What do you think of when you read the following words: belly, chop block, chuck, crab, cut back, dash, hash, rub, scoop, scramble, spread, turnover, and wishbone? I think about cooking and eating, but my husband thinks about football. Oddly enough, these words exist in both kitchen and football terminology. With Super Bowl Sunday quickly approaching, you’ll want to get that tight end of yours into the kitchen and try this fabulous recipe that puts a fresh and flavorful new spin on twice-baked potatoes. 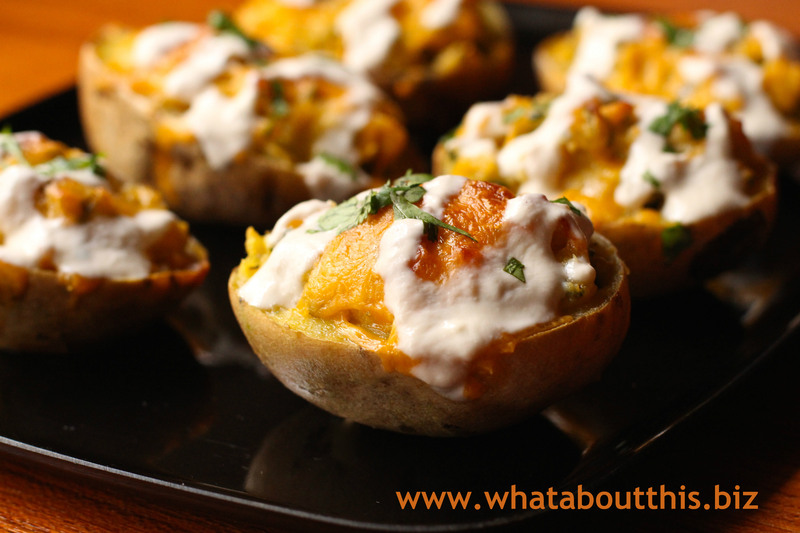 One taste of a Poblano-Cheddar Twice-Baked Sweet Potato and you’ll request an instant replay! 1. Preheat the oven to 400 degrees F. Scrub the sweet potatoes and dry well; transfer to a baking sheet. Bake until easily pierced with a knife, about 40 minutes. Remove from the oven and let cool 5 minutes. 2. Roast the poblanos over the flame of a gas burner (or under the broiler), turning, until charred all over, 4 to 5 minutes. Transfer to a bowl, cover with plastic wrap and let cool. Peel off the charred skins and remove the stems and seeds. Finely chop the peppers and set aside. 3. One at a time, hold each sweet potato with a kitchen towel and halve lengthwise. Scoop the flesh into a large bowl, leaving a 1/4-inch-thick shell. Mash the flesh with the butter, 3 tablespoons crema, the lime zest and adobo sauce until smooth. Stir in the poblanos and scallions; season with salt and pepper. Brush the potato skins with melted butter and season the insides with salt and pepper. Return to the baking sheet. 4. Mound the filling into the sweet potato skins and sprinkle the tops with the cheese. Return to the oven and bake until the filling starts browning and the skins are crisp, 16 to 18 minutes. Season with salt. 5. Stir the remaining 3 tablespoons crema in a small bowl with enough lime juice until thin enough to drizzle. Season with salt. Drizzle the lime crema over the sweet potatoes and top with cilantro. 1. Instead of buying packaged shredded cheese, I always grate my own cheese. Sure, packaged cheese is more convenient, but it also contains ingredients to keep the cheese from caking; ingredients that I don’t particularly want in my body. I’ve noticed that packaged shredded cheese doesn’t melt as well as the cheese that I grate on my own. 2. When making twice-baked potatoes of any kind, always bake one or two additional ones, so that you have enough potato mixture to mound into the potato shells. Otherwise, your stuffed potatoes will appear rather flat. 3. Definitely make the lime crema! It adds a bright and tangy counterpoint to the sweetness of the sweet potatoes. 4. This is not a hard recipe to make, but it does take some time to roast the poblano peppers and prep the other ingredients. To make this recipe more efficient, it helps to have all the ingredients prepped ahead of time. The sweet potatoes must be hot in order to melt the butter and absorb the crema. So if you are baking the potatoes ahead of time, you must stir in the other ingredients in step 3 while the potatoes are still hot. These potatoes can be assembled and refrigerated until it’s time to pop them into the oven.